Pipeline can be big with scikit-learn, let’s dig into a visual way to look a them. Let’s vizualize a simple pipeline, a single model not even trained. 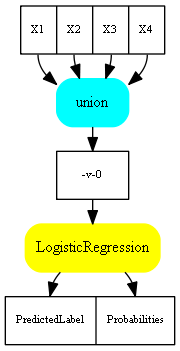 The trick consists in converting the pipeline in a graph through the DOT language. It is lot better with an image. scikit-learn instroduced a couple of transform to play with features in a single pipeline. The following example is taken from Column Transformer with Mixed Types.